The profession is overcrowded and there are now more lawyers on this planet than soldiers. If you want to enjoy this game, you have to stand out from the crowd. Are you ready to break away from the crowd? 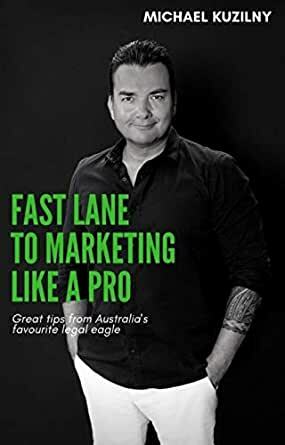 In this short and easy to read book, Michael brings together the very best-kept marketing secrets from superstar lawyers around the world. Author Michael Kuzilny is a successful Australian based lawyer who has been working in the criminal justice system since 1986. He operates his own legal firm called MK LAW. He is a published author of numerous books, a legal commentator on National television and current affairs, and is the host of his own TV show called “Tough Times Never Last”. Michael thrives on inspiring people of all ages to achieve greater levels of business and personal success. A friend of mine told me I should definitely read this book and I did. His not my friend anymore. I suppose the author of this book didn't even make any effort to chceck what he wrote and the way he wrote it. It looks like a colection of poorly written blog posts with absolutely no original ideas, no in depth analysis. This book will tell you that "superstar lawyers" are well dressed and listen to other people. Wow! Amazing, isn't it? Marketing secrets of the world's superstar lawyers by Michael Kuzilny is a self-help book about aimed at helping one became the world's most sought after lawyer. The legal system is crowded with millions of lawyers all trying to make it big and become the best and that is what is exactly this book show you, how to brand yourself, have the right image, stand out from the crowd and get all the clients you need. Michael Kuzilny lets you in on the secrets of developing a strategy that speaks to your intended audience and achieve your all the dreams you had when you went to law school. The author is a success lawyer and his advise comes from years of experience. This book would be useful to anyone looking o make it big as a lawyer; be it a law student, a new lawyer, or as already established lawyer looking to give their career a push in the right direction. The book is very informative and practical and would be a valuable addition to any lawyer's library.